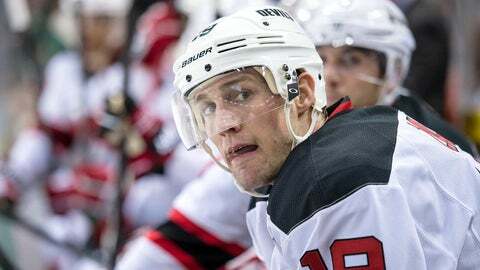 New Jersey Devils veteran forward Travis Zajac is content on remaining in the Garden State. Travis Zajac will not need to apply for a change of address card in the near future. That is the sentiment of agent Kurt Overhardt, who told TSN’s Darren Dreger that there’s "absolutely no truth" to reports that the New Jersey Devils veteran forward is getting traded. Speculation began to intensify after Sportsnet’s Elliotte Friedman reported that "there’s more than one NHL exec" who believed new Toronto Maple Leafs general manager and former Devils’ head man Lou Lamoriello would "love" to acquire Zajac. Zajac, who does have a no-trade clause in his eight-year, $46 million contract, did his best to silence the talk after he scored twice in the Devils’ 4-2 preseason victory over the Philadelphia Flyers on Wednesday. "It’s part of the business," the 30-year-old Zajac told Rich Chere of NJ.com. "I don’t know how much truth is behind any of that, but I’m committed to this team. I’m trying to get better and prove myself to the coaching staff here. I can be a player to help this team and get it going on the right direction." Lamoriello and Zajac have history, naturally, as the Devils traded up to acquire the latter with the 20th overall pick of the 2004 draft. Zajac, who scored 11 goals and set up 14 others in 74 games last season, has recorded 127 tallies and 221 assists in 625 career contests – all with New Jersey.